This service is to help create a new love life for you or move your relationship to the next level-step over that crossroads and get on with the best love and life you can have! This is a 2 day service, during which I will created a loaded and dressed red, crucifix candle. I'll then create a petition from the photo(s) provided, if applicable. 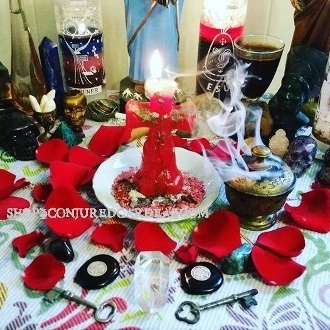 I will then set the necessary altar, tools, offerings and evoke the proper spirits to help you achieve your goal. Thank you and I look forward to serving you!